Hi, my name is Herman! If you return me to the front desk of The Heathman Lodge you can collect a special reward! If I were to try to get there myself it would take me more than a week. I am literally the slowest moving creature on the planet and normally sleep up to 20 hours a day! See where Herman could be hiding! 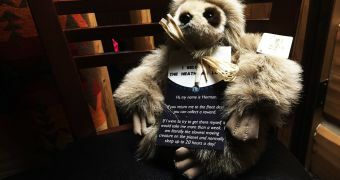 Recently, The Heathman Lodge adopted a new family member, Herman the Sloth. Just like sloths in the wild you might find Herman hiding out in various locations all over the Lodge. He can be tough to find, just like wild sloths in their native habitat. In the rainforests of Central and South America if you’re really lucky you’ll spot a sloth, but it will be very difficult. They live in trees and move very, very slowly. It’s even believed that they gained their name from the deadly sin in the Bible. 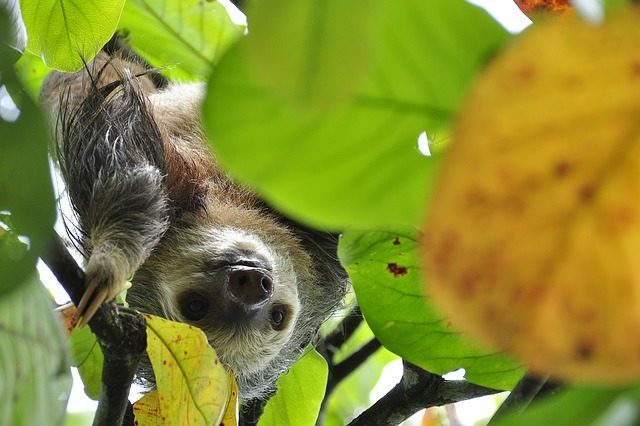 However, being extremely slow is not usually dangerous for sloths as long as they stay in the tree canopy, as it makes sloths almost invisible to birds of prey flying overhead. They spend almost their entire lives hanging upside-down in the trees, leaving the tree canopy only about once a week to take care of eliminating. Sloths have big eyes, flat heads with small ears and short snouts. Their bodies might make it difficult to believe that they are closely related to anteaters, but it’s true. They have long legs, a short or no tail. While all other mammals - even giraffes - have necks with seven vertebrae, a sloth will have eight or nine vertebrae in its neck. This allows some species of sloth to turn their heads almost 270-360°, almost as much rotation as an owl. If you’ve seen Disney’s Zootopia, you’ll remember their depiction of the sloth (Flash, Flash 100-Yard Dash!). The characters in the movie, other than speaking so we can understand them, are actually pretty accurate. Everything about the sloth is slow. Sloths move so slowly, that if you were to walk for one minute, it would take a sloth almost an hour to catch up. Because of this, they rarely walk along the ground and even then you can’t call it walking because their long claws make that impossible. Instead they slide on their bellies and pull themselves along with their claws. While on the ground, they are vulnerable to ground predators like jaguars and ocelots. Even though they do not walk along the ground very well, they are surprisingly good swimmers and will get into and out of the water without ever touching the ground, instead grabbing onto branches that extend into the water. Sloths even digest their food extremely slowly. Let’s compare a sloth’s digestion to yours and that of a cow. Assuming you’re healthy, when you eat it takes one or at most two days to digest your food entirely. For a cow, it takes about three days to digest what they eat. Even though they’re much smaller than us, and we’re certainly much tinier than a cow, the sloth’s digestion is much slower, taking one or two months to metabolize what they eat. Even their temperature is low compared to other animals. A dog’s normal temperature is 102.5° F, and a cat’s normal temperature is 101.5° Fahrenheit. For a sloth, a normal temperature is much cooler than their or even yours (98.6ish° F) at anywhere from 86° to 93° F.
While sloths eat mostly the buds, shoots and leaves in the trees where they live, they can also eat insects, small lizards, and carrion. However, their small molars and digestive tracts that look very much like that of a cow - their stomachs having multiple chambers - mean they are better suited for eating the plant life, and some plants are known only to be able to germinate after their seeds pass through a sloth’s digestive tract. What is in a sloth’s stomach can provide up to two-thirds of its body weight. Though they are named two-toed and three-toed, sloths are not called this because of their toes, but due to the number of fingers they have - all sloths, in general, have three toes on their hind feet. The claws on their feet are the sloths’ only natural form of defense once sighted by a predator, and those claws are powerful. Two-toed sloths are larger than three-toed sloths, and three-toed sloths are usually less aggressive than two-toed sloths. With an inability to walk, sloths spend most of their time in trees, using their claws to hang upside-down from branches. Their claws are very sturdy, even allowing them to sleep while hanging in the trees by their claws. Sometimes sloths can remain hanging by their claws even after dying. Early explorers who first studied sloths believed that they spent almost twenty hours a day sleeping, but biologists have more recently determined that they only sleep about ten hours a day. Because they spend about 95% of their twenty- to thirty-year lives upside down in the trees, the hairs of their fur are situated the opposite of other mammals, so that when it rains, water will flow and not get caught in their fur. The sloth’s fur creates a perfect place for lichens - a combination of fungi and algae - to live, as well as moths and other insects. While this would probably be annoying to you or me, it’s a symbiotic relationship for the lichen, insects, and sloth. 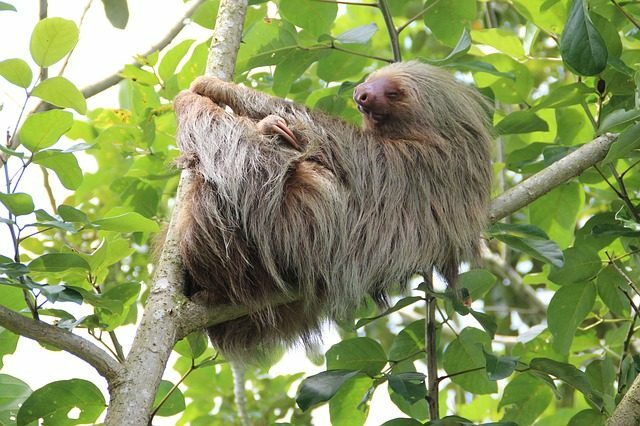 The tiny organisms thrive in the fur of the sloth, and in turn, they give the sloth’s fur a green tinge that allows it almost to disappear in the tree canopy where it lives. The sloth will also ingest some of the organisms when it licks its fur, which provides a little extra nutrition, as well as helping them to fight off disease. We’re excited that Herman has joined us at the Heathman Lodge. Every week he goes out exploring, and if you look carefully, you just might find him. If you do, bring him to the front desk for a prize!